Visitors to the British APCO (BAPCO) public safety exhibition in Coventry next week will be able to get their hands on the Bittium Tough Mobile and its HybridX extension, an add-on which turns an LTE smartphone into a push to talk (PTT) radio and body camera. Bittium is a Finnish manufacturer with more than 30 years’ experience in radio communications technology and in the past few hands has turned its hands to smartphones at a time when public safety authorities are upgrading their equipment. For example, in the UK, EE is building a £1 billion LTE-based Emergency Services Network (ESN) that will allow ambulance, police and firefighters to access richer applications while ensuring the same reliability of the existing TETRA system. The Bittium Tough Mobile is an Android based smartphone with hardware-based security that integrates with customers own software. It’s the first device to be certified to handle confidential information by the Finnish government. It has dust and shock protection, its touchscreen works in wet conditions and it works on 9 different LTE bands, including public service bands. Its user interface can be customised and branded should a customer need to personalise it. What the HybridX Tactical Module extension does is allow the device to connect to a private mobile radio (PMR) like TETRA. It comes with a smart holder, which combined with a 170-degree video lens, turns the device into a body camera that can transfer data over the LTE network. When analytics is applied on top of this, then authorities an identify cyber attacks too. Bittium says this combination means police officers, firefighters and other public safety officials can gain more capabilities without sacrificing reliability. What’s more, it means there is less equipment that has to be taken out into the field. 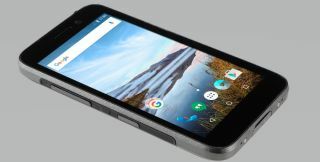 Rugged smartphones have long been popular in areas such as construction and logistics, while secure phones such as BlackBerry and Blackphone have found favour in areas dealing with sensitive information. Bittium hopes that by offering both the digital and physical aspects of the device, it can find favour in sectors where both the environment and the types of data being collected are challenging.